Yeah, but: Great pizza. They deliver. The Long Version: Pizza is usually fast food, but it doesn't have to be. Sometimes it can take half an hour, or maybe a little more, and sometimes it isn't $4 for a dinner-sized slice. In short, not all pizza needs to come from Cora's. 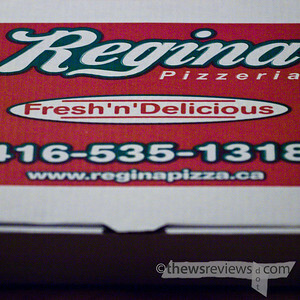 There's also Regina's. 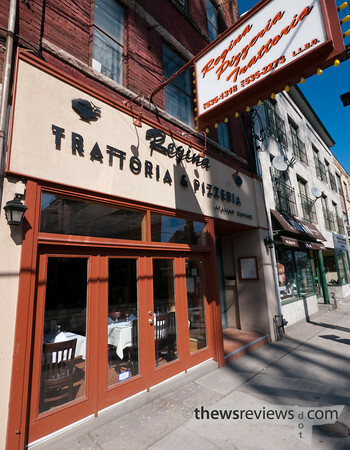 I've never actually been inside of their restaurant on College street, but it looks very nice, with real tablecloths. Instead, I was introduced to the food years ago by a very Italian co-worker who would get a pizza delivered every month or two. It's not cheap, but it's worth it and a large can feed three or four, or be stretched to a second meal. The sauce is awesome, there's plenty of cheese, and it's cooked perfectly. Penny and I get it with roasted red peppers and grilled chicken - maybe not traditional, but very nice.